How is it that I didn’t discover couscous until recently? I mean, it’s such a neutral dish base – you can put anything in it. I guess that pasta has always been my blank palate of choice. Must be an Italian thing. 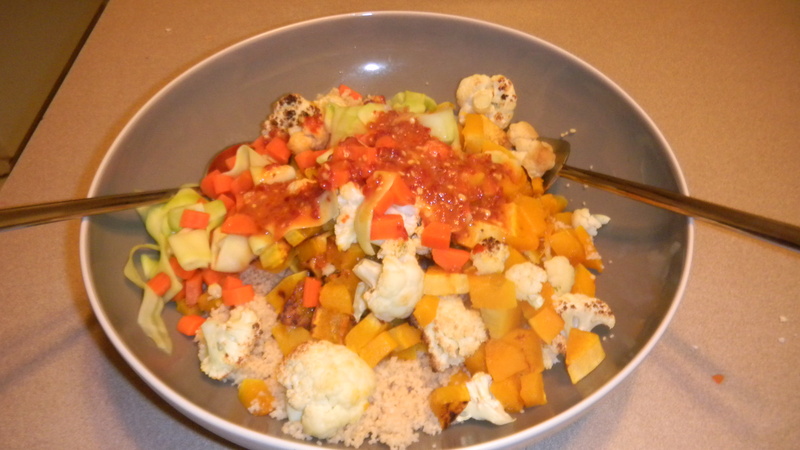 I made this tasty couscous dish for dinner a little while back and had great results. I love that this meal is just packed with veggies. The couscous was whole grain too, so this was quite a healthy meal. I started out with this as the base recipe, but I made some changes. I started out with the butternut squash. I put all of it into a microwave safe bowl, added about 2 teaspoons of water, covered it with vented plastic wrap, and let it cook in the microwave for about 6 minutes, stopping half way to stir. Next, put some foil in a baking pan, and spread the cauliflower and squash out. Salt and pepper to taste, and spray some cooking spray over the top. Broil for about 8 minutes, stirring the veggies once. Start making the couscous how the package directs. I simply added my couscous to boiling water, turned off the heat, and let it sit there. No salt or butter added. 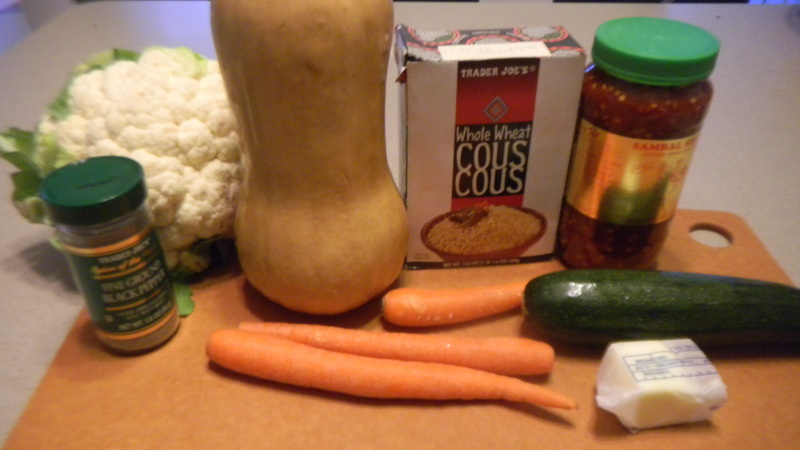 While the couscous and squash/cauliflower are cooking, start peeling and dicing the carrot. Once chopped, peel the zucchini and use the peeler to create zucchini “ribbons.” Add the carrots to a new pot of boiling water and let them cook until softened. When the carrots have about a minute left, throw in the zucchini ribbons. Once everything is cooked, drain the carrots/zucchini, remove the squash/cauliflower from the oven, and fluff the couscous with a fork. Toss everything into a large serving bowl. For the sauce, melt about 2 tablespoons of butter with 1/4 cup of Asian chili sauce. pour the sauce over the top. This recipe will make A LOT of couscous. We got dinner and and least two lunches a piece out of it. 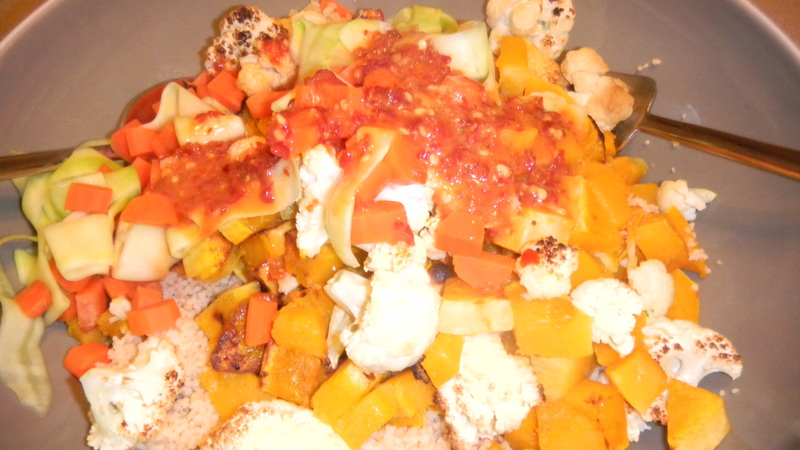 I really like the almost sweet flavor that the roasting did to the squash and cauliflower. We’re not big cauliflower eaters in our house, but this recipe definitely left me wanting more. In case you’re looking for some side dish and drink pairings, we ate the couscous with some butternut squash soup (we got a lot of soup out of this recipe!) 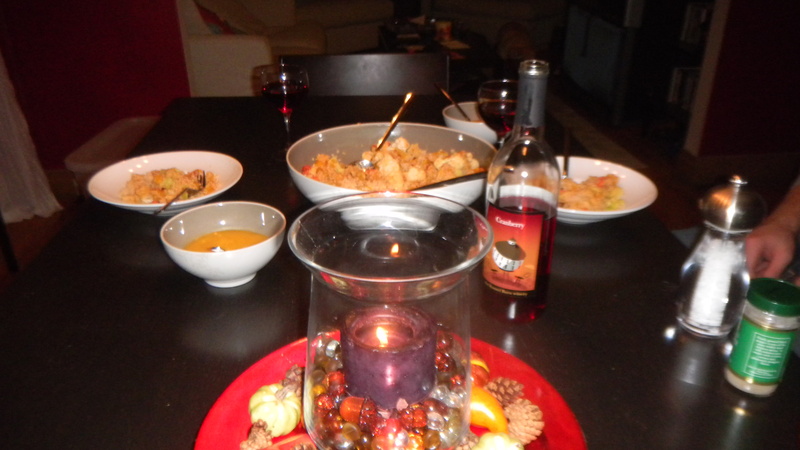 and drank some cranberry wine too. Some easy variations on this meal would be to add in some grilled chicken or any other veggies you’d like, especially mushrooms. I love cinnamon rolls for breakfast. No time to make them on week days, so I’ve mostly resigned them to being weekend treats. I’m not too much of a food snob to grab a can of cinnamon rolls, but sometimes, I’m too lazy to even run to the store for them. This recipe came out of using what I had in the house already. They tasted very similar to the canned kind, if you’re wondering. Melt the butter and mix it with the syrup. 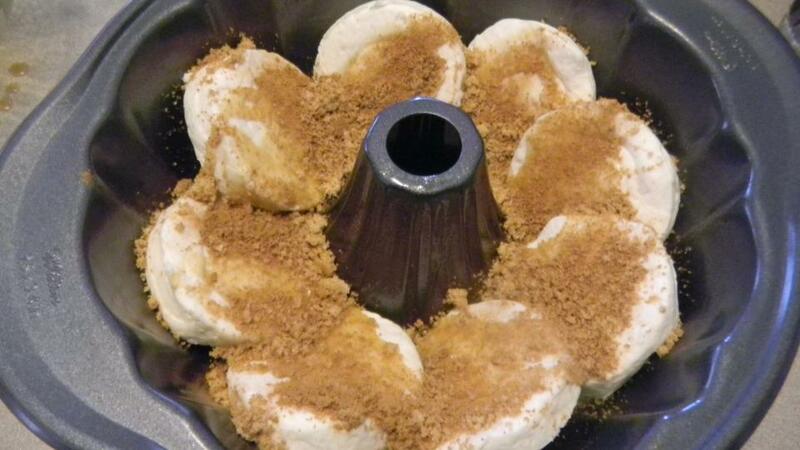 In another bowl, whisk together the sugar and cinnamon. Pour half of each mixture into a bundt pan sprayed with non-stick cooking spray. 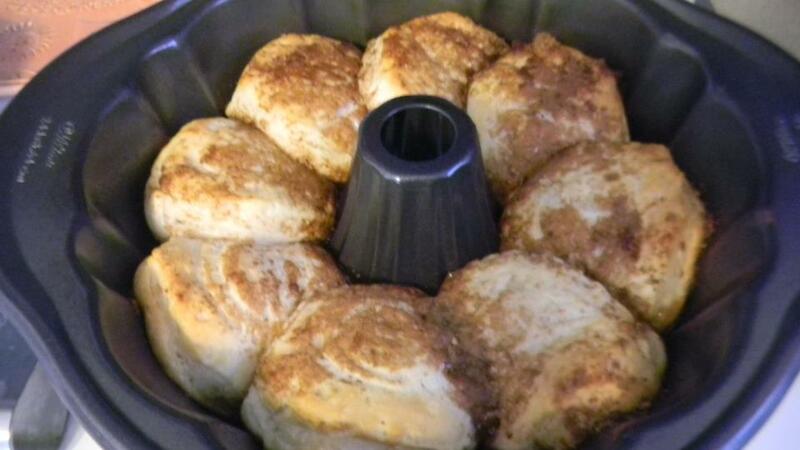 Spread out the eight rolls in the pan. Top with the other half of the ingredients. Bake about 20 minutes, until rolls look done. 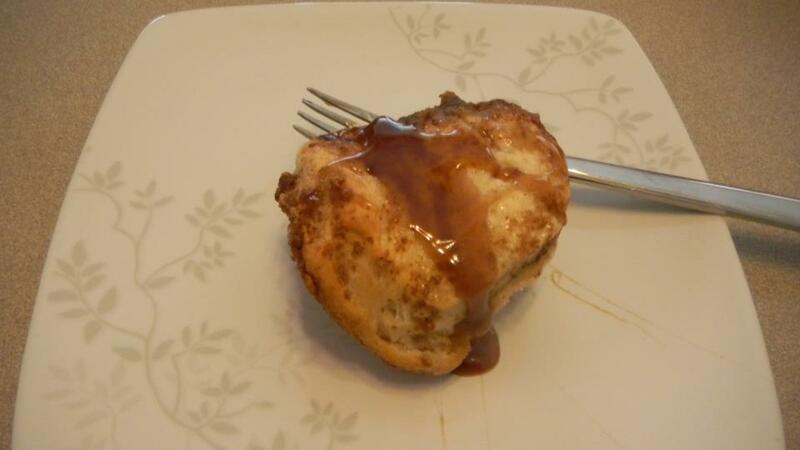 As a slight modification, I’d recommend putting each roll into the cinnamon and sugar mixture before putting it in the pan, then topping the rolls with any that’s left. Not that this recipe needs any upgrades, but I thought I’d try it next time to see if it makes a difference.